Genesis Contra: Hard Corps (JPN) in 14:11.9 by adelikat. Contra: Hard Corps is the only game of the Contra series released on the Genesis / Mega Drive console. In this game, you get to choose between four characters, each with different abilities and weapons. This game has four completely different final stages, each with a different ending, depending on the choices you make earlier. 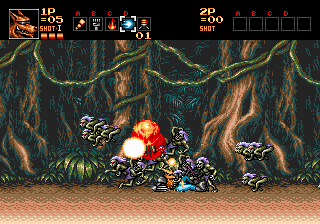 The Japanese version was chosen because, for some reason, it gives the players a health bar, allowing them to take some damage without dying. Fang is used due to a glitch that allows him to deliver fully charged D weapon shots, without taking time to charge it.